The emphasis on running away reminded me of Flash: Rebirth, which has made a point of characterizing Barry Allen’s life (unfairly, but he is depressed right now) as a series of choices from which he ran away. Both miniseries are about taking a character who is not ready to be a hero (Barry with his not-quite acknowledged death wish, Carin with her inability to overcome fear) and moving them to where they need to be in order to become better heroes. The villain, Charnel, is not terribly interesting. Visually, he’s X-Treme Doomsday, with longer spikes. Personality-wise, he’s obsessed with killing people who have super powers, more or less just because. He does make a remark about testing people for worthiness to live at one point, but it rushes by so quickly that I’d forgotten it by the time I finished. Still, Charnel does what he needs to, which is to be is a threat who can’t be outrun, and who will make things worse if the hero goes for help. Oddly, despite the fact that 1990s Image heroes are more likely to kill than DC heroes of any era (Kingdom Come was in many ways a reaction against the storytelling style and character types that made Image popular), judging by this book I’d have to say that today’s DC books are actually bloodier. I’m sure it’s just a matter of this particular book being less so. 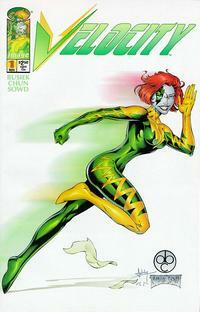 I also re-read the Joe Casey/Kevin Maguire Velocity: Pilot Season one-shot. By now, Carin has grown up and seems to be a seasoned pro. She starts out delivering an organ for a transplant (hmm, reminds me of the first issue of Wally West’s series) in the first few pages. This sets up the main story, which manages to balance a relatively simple, but well-structured hero-vs.-villain plot with a look at her personal life. (Check out CSBG’s review of the issue for more detail.) Also: Kevin Maguire draws fantastic facial expressions. When I first read the book, it was my introduction to the character, and it did a perfectly good job as the proverbial new-reader-friendly book. 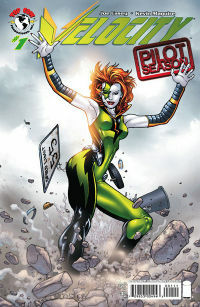 Now, having read her previous miniseries, it’s interesting to see just how far she’s come. It really is too bad the series ended up being canceled before it ever launched.